Three people have been arrested on suspicion of murder after a man was stabbed. 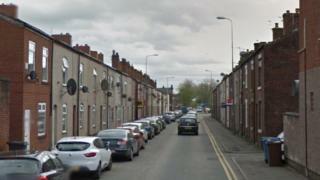 Paramedics found an unresponsive man in his 30s, who had a wound to the stomach, in Leigh, Greater Manchester, at about 23:45 GMT on Saturday. He was pronounced dead at the property on Platt Street. Two men, aged 44 and 48, and a 22-year-old woman have been detained on suspicion of murder and remain in custody. Det Ch Insp Stuart Wilkinson appealed for anyone with information to contact police. "Local residents will expect to see a continued police presence as the crime scene will remain in place at the property while we gather vital evidence and continue with forensic work," he added.